I get message saying I can't proceed because ITunes was installed from Microsft Store. I don't know how to deinstal it. It doesn't appear in the Control Panel list. 1. To start with, please click the Windows icon in the lower left corner of the desktop. And then, please find the iTunes icon. 2. Please right-click iTunes. Then the interface below will display. 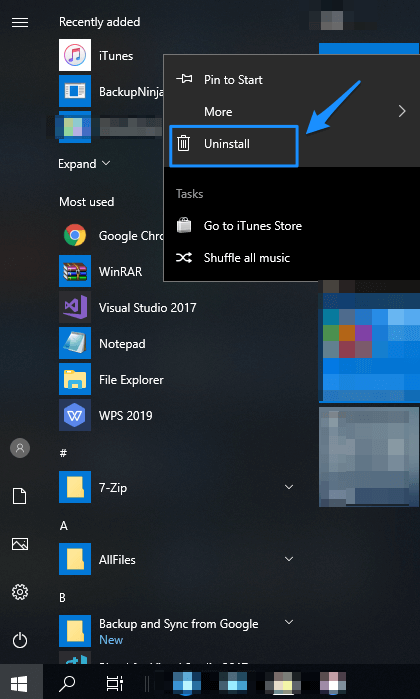 Please click the Uninstall button to remove iTunes. 3. After that, you will receive the following pop-up messages to confirm whether you want to uninstall iTunes or not. Please kindly click Uninstall. Next, iTunes will be uninstalled from your computer completely. I have been facing trouble when I was going to install itunes on windows 7 which needed to be fixed. So please help me to find the proper solution so that I want to solve the problem. Thanks for joining iMobie Forum and i am sorry for the delay reply. This is Dorothy and i hope to be able to help you. Please kindly tell me whether it works for you or not. If problem persists, would you please kindly send a screenshot about issue you encountered with us for further diagnosis?